You know something? The logistics alone of the Great Penguin Hunt are staggering, but now I also have to figure out what kind of gun to use in taking one of these majestic and ferocious beasts. I brought this up to my fellow penguin hunter, Greg, and he offered the dynamics of many different makes and calibers, but as he did so, he was quick to recommend certain ammunitions, based upon destructive ability. You see, I suspect Greg is not so much interested in the bird being stuffed and mounted in his living room, but in assuring the wild penguin doesn't get back up to come at him and peck him to death. And to be fair, I'm not altogether sure how it would look on the wall, mounted next to his elk. Ballistic tables were brought into play, as we may only have one shot. That whole pesky 'protected species' crap is playing hell with my plans and we may have to shoot one from a seagoing vessel, which means I may need a really hot round to compensate for ocean swell. I'm thinking about the .223 Winchester Super Short Mag. The .223 WSSM is an awesome round. 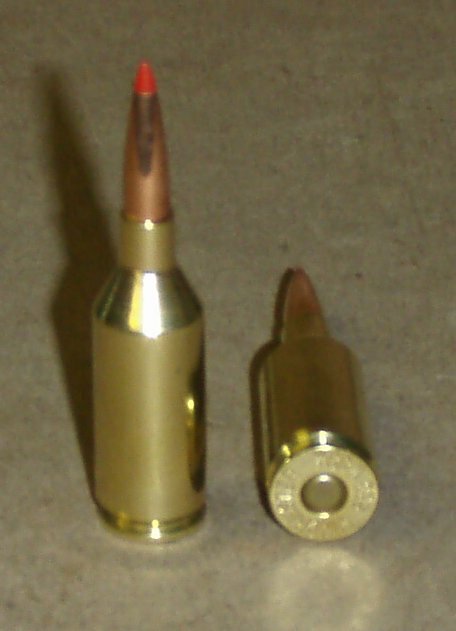 Imagine a .22 bullet coming out of the cartridge of a .300 Win Mag, with muzzle velocities approaching 4,600 feet per second making it the fastest .22 caliber in production today. With the right hollow-point (maybe a small 40 grain copper jacket), I think I can explode the heart with little damage to surrounding meat, but may also be able to save enough of the hide to successfully mount this bad-boy right next to the new 42 that I got for Christmas. Plus, if I can get one of the hunting magazines to film the poaching, er... hunt, I can also watch it on high-def. Oh, it just gives me shivers to think about it. Greg, however, is of a different mindset. After great deliberation, he has settled on the .450 Bushmaster. This is an AR-15 style rifle he can equip with a Swarovski Ballistic Turret riflescope with 2.5-15x56mm precision. Of course, this particular rifle utilizes a 250 grain bullet traveling at 2,200 feet per second that will leave a concussive wake that will knock down small elephants. I'm pretty sure they don't yet have Dumbo hanging out in the lower hemisphere, so we should be good. With that particular combination of firepower and optics, Greg can probably shoot an Antarctic rockhopper from Glendale. Of course, what will be left of the carcass would be just enough to put on a MacDonald's Egg McMuffin. Greg, I think, is more engaged in the thrill of the hunt than the succulent taste of penguin, but I could be wrong about that.